A short trip down the stairs and you're rewarded with sugar-white sand and blue-green shores. Worth every step! The screened in section of the deck is the perfect place to enjoy a dinner outside, accessible from a slider off the dining area. Enjoy dinner on the deck without the bugs! This convenient changing area is private below the deck and a great place to change out of your wet/sandy bathing suit. Plenty of hooks to hang your wet towels too! 153 steps to the beach and worth every one of them to enjoy your day playing in the water. You'll never grow tired of this scenery! 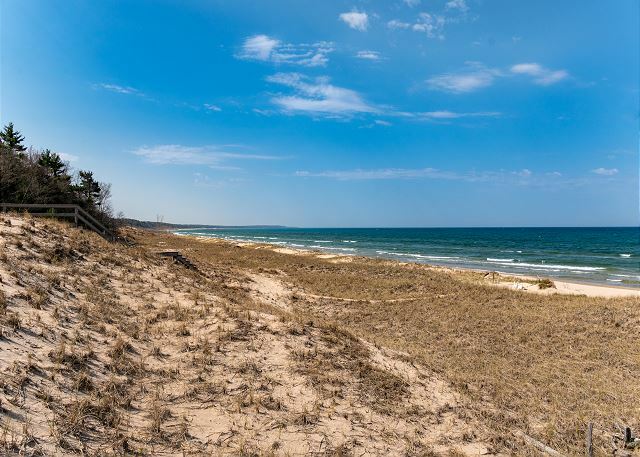 Blue skies and sandy shores, it's what your vacation is made of! 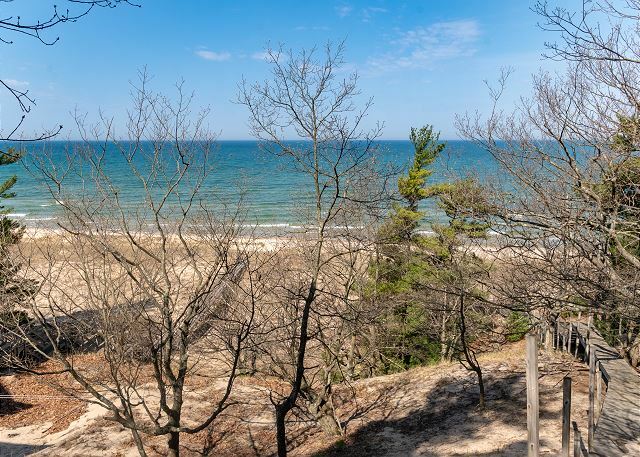 You'll enjoy the hike down to the beach almost as much you'll enjoy the beach. You won't believe this is all yours when you book a stay at TImbershores! 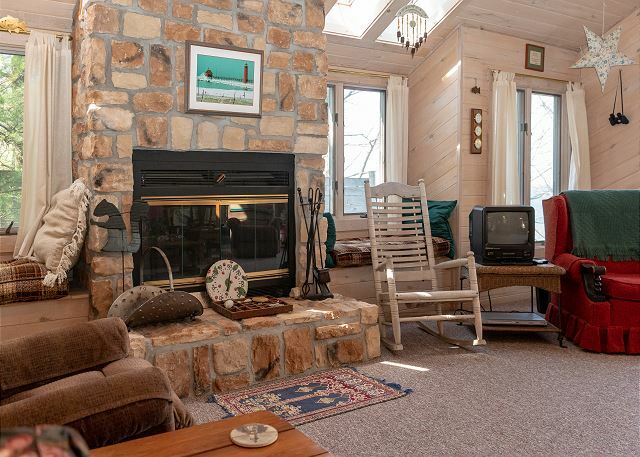 Although just outside of town, this cottage feels secluded and offers plenty of space to roam and explore! 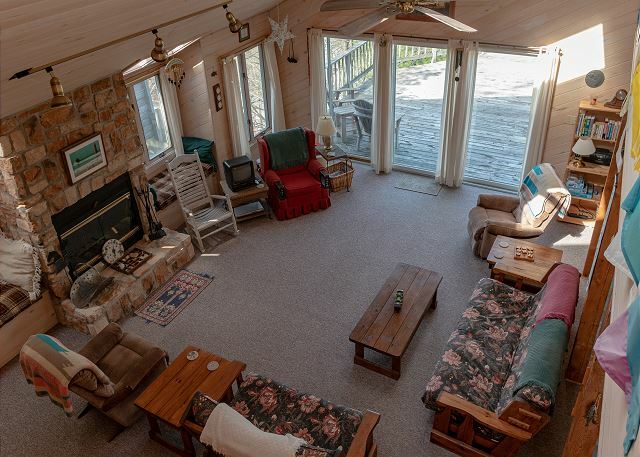 With plenty of seats for everyone, you'll enjoy lots of family togetherness playing games, putting together a puzzle or just chatting in front of the fireplace. Grab the best seat in the house on either side of the fireplace-curl up in the window seats with a good book and enjoy your views. The tall ceilings and open staircase makes this home feel so bright and airy. You will love all the space to spread out and get comfortable after a long day in the sun. 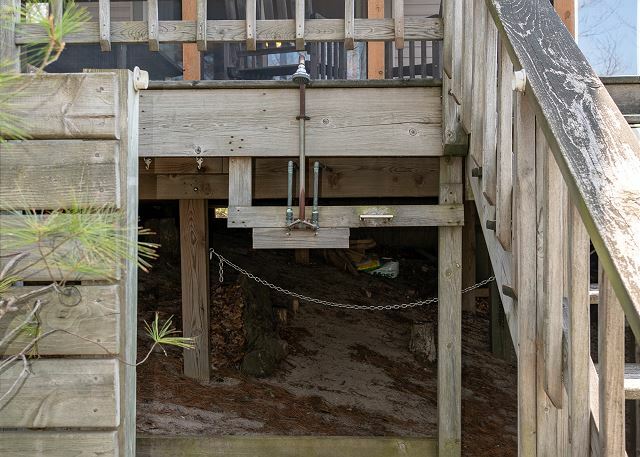 The deck is accessible from many different locations, including a sliding door off the living room. 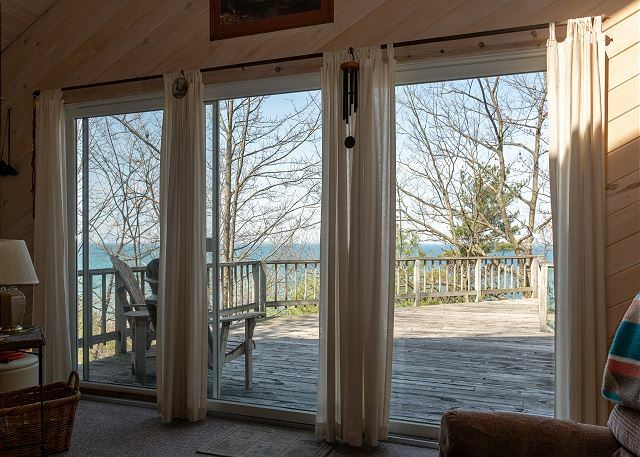 The slider off the living room offers lots of natural light and views of the lake. The kitchen includes everything you need to create a delicious dinner for your family. Feel a part of everything with this open kitchen. Sit at the kitchen counter-top breakfast bar for a quick lunch or breakfast. Eat inside or out. The inside dining table seats 6. 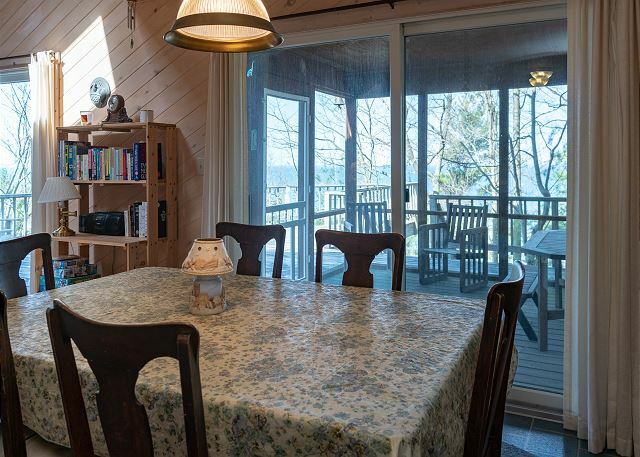 The sliding door behind the table leads to a screened-in porch with patio table and chairs. This half bathroom is on the lower level just off the Kitchen and has access to the Laundry Room. 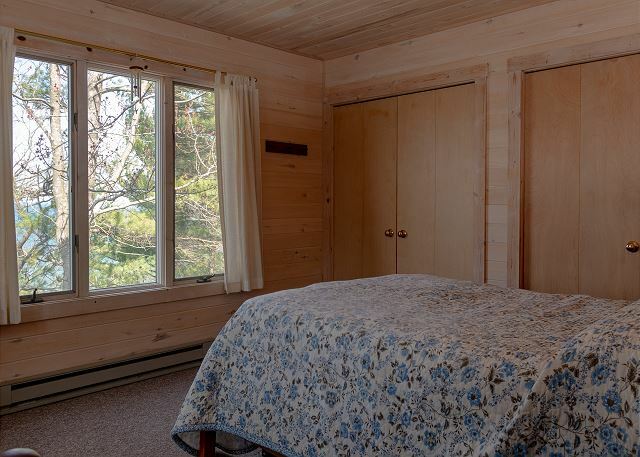 This bedroom has views of Lake Michigan and a full size bed. Watch the sun come up over Lake Michigan from bed. Enjoy the views of the beach from your bedroom. This bedroom has a twin with another twin trundle. Bedroom #3 has another twin with twin trundle. This full bathroom is upstairs and has a tub/shower combo and double sinks. If you're looking for a place to begin making summer vacation memories with your family, Timbershores is it! 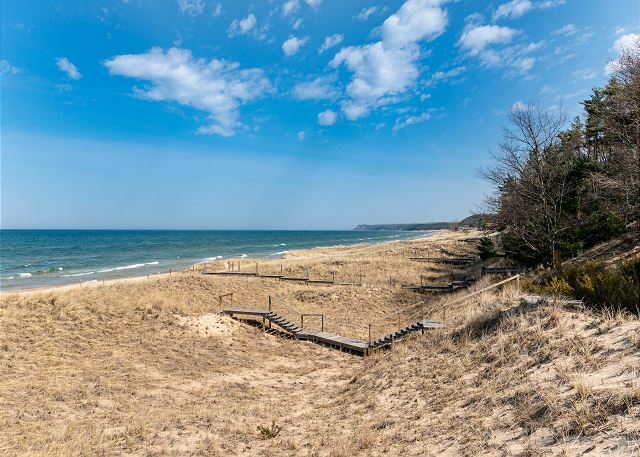 With room for six, it's the perfect place to get away from it all and enjoy a week soaking in the sunshine, building sandcastles and splashing in Lake Michigan. This 2-story cottage feels like a vacation home from the minute you walk in the door. You will feel right at home! The main floor is open and spacious with tall ceilings and lots of natural light. A half bathroom and laundry room are just inside the door. Walk through the short hallway into the kitchen, dining area and living room. 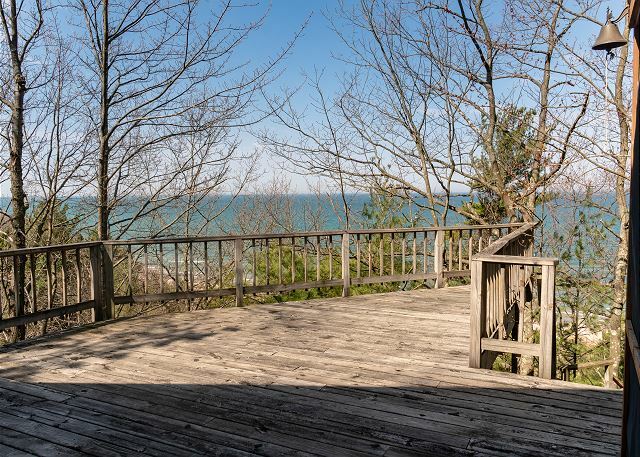 The living room has plenty of seating, and a slider to the large deck with views of Lake Michigan. 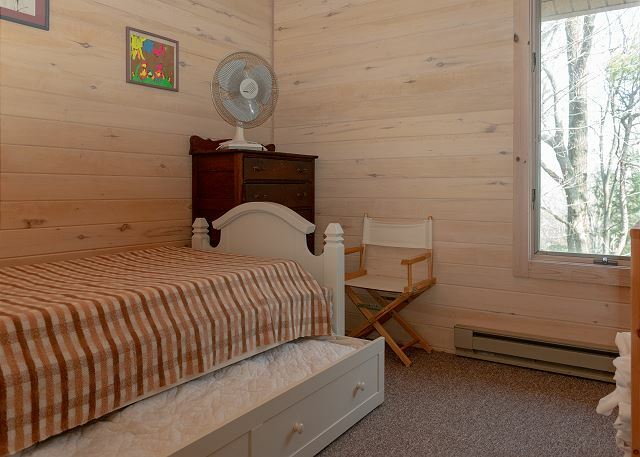 Upstairs you will find three bedrooms and a full bathroom. The main bedroom has great views and a full size bed and the two other bedrooms each have a twin with a twin trundle. The bathroom is plenty big for all to share with double sinks and a tub/shower combo. Please note that this property does not have air condition. 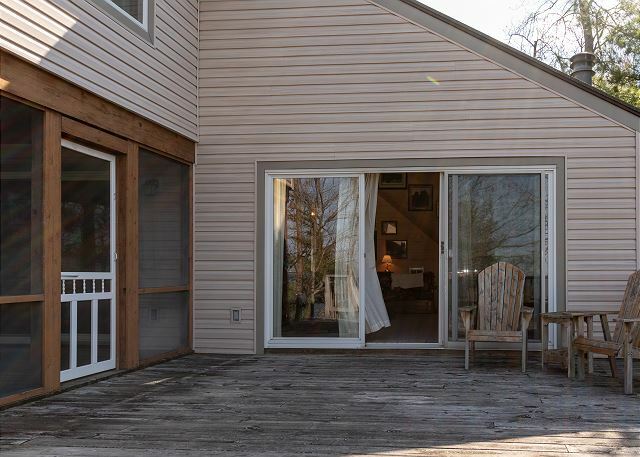 The large deck has a screened in porch for outdoor dining with no bugs, as well as lots of open deck too. Down a section of stairs is an outdoor shower and private changing area. 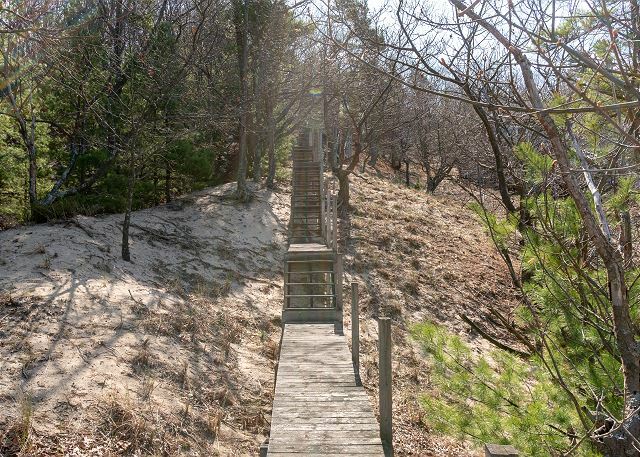 Continue on down the remainder of the stairs to your own private beach right on Lake Michigan. The cottage sleeps 6. All bed linens and bath linens are provided. 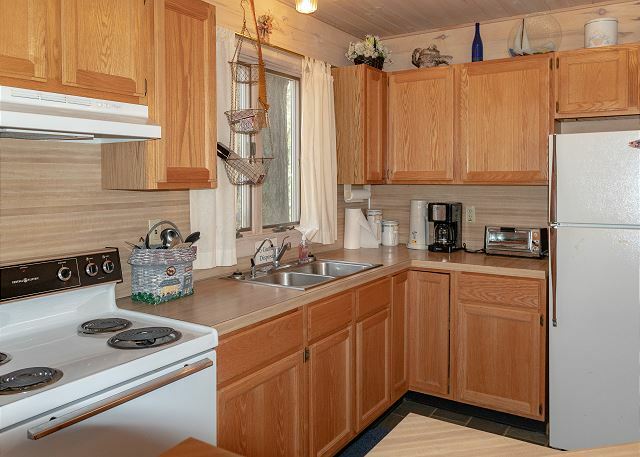 The kitchen comes fully equipped with cooking ware and dinnerware. 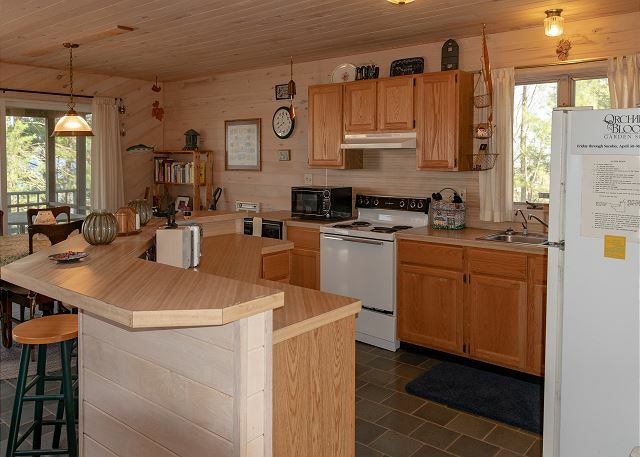 Eat a quick meal at the counter-top bar with room for three, or the dining table, which seats 6. A screened in porch with patio table and chairs is directly off the dining room via the slider. 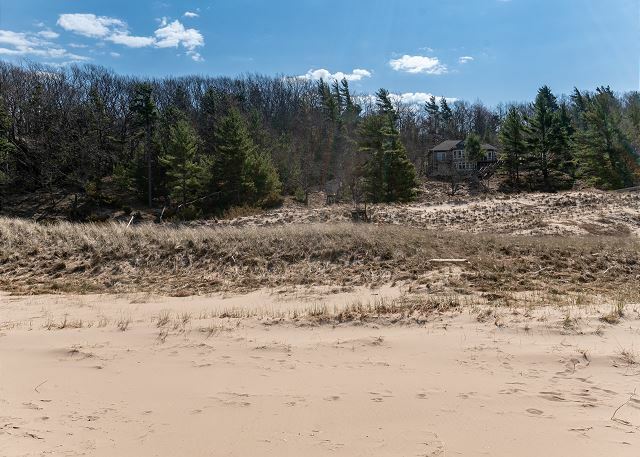 Nothing beats having your own private beach just a short walk down the stairs from your home. 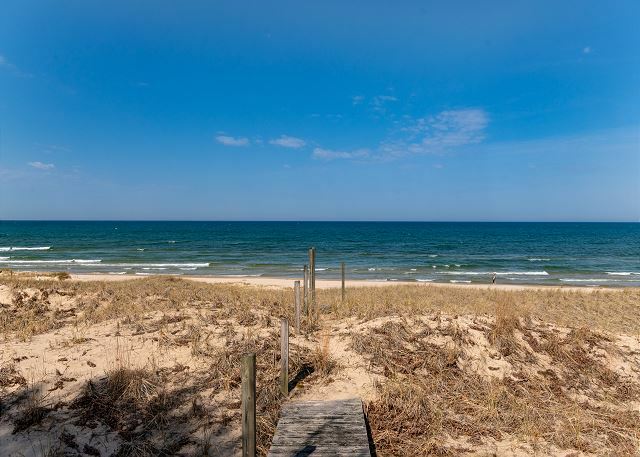 You'll love spending your day playing in the waves or building sandcastles. Be sure to bring a book and spend your day relaxing in the sun! Make sure to set aside some time to go explore downtown Pentwater, just a few minutes drive from Timbershores. 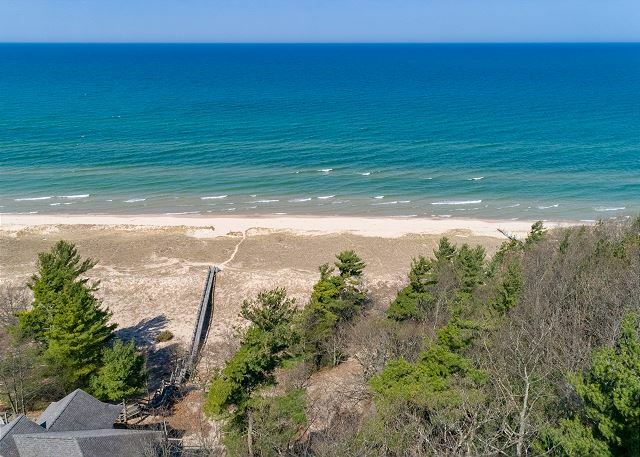 Visit the Pentwater Lighthouse, do some shopping in the charming artisan shops, or spend a fun day at AJ's Family Fun Center playing miniature golf and racing Go Karts. Overall the location was great for our family. It is not far from the beach which is what we were looking for. Check in/Check out was easy and we never needed to contact the rental office. 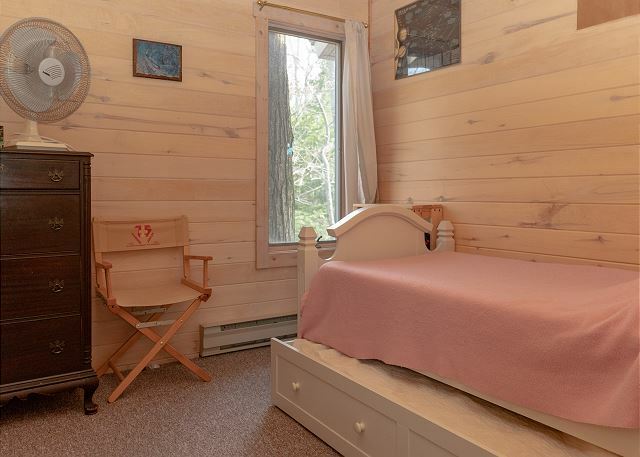 The house is okay, the furnishings are dated for our taste and there is no central air, but like I said the location is why we booked this property. The house was stocked with board games which we did enjoy with the kids. The driveway at this property is an issue for me. It is very steep and at an angle so backing in was tough. The description on VRBO says that two vehicles can fit in the driveway but in my opinion that would be hard especially when your needing access to your trunk. 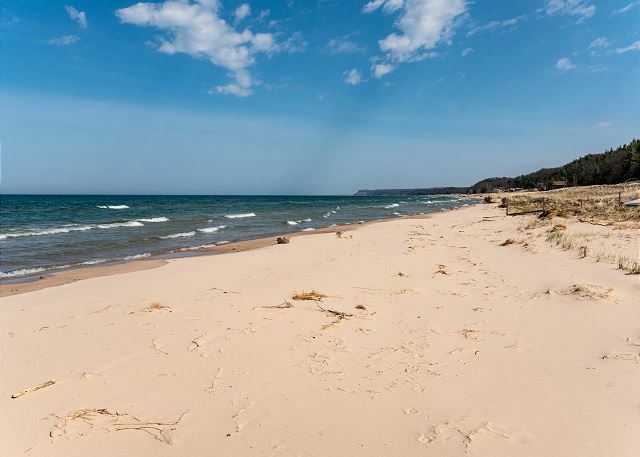 The beach is beautiful and plenty of space to lay out and make sand castles. 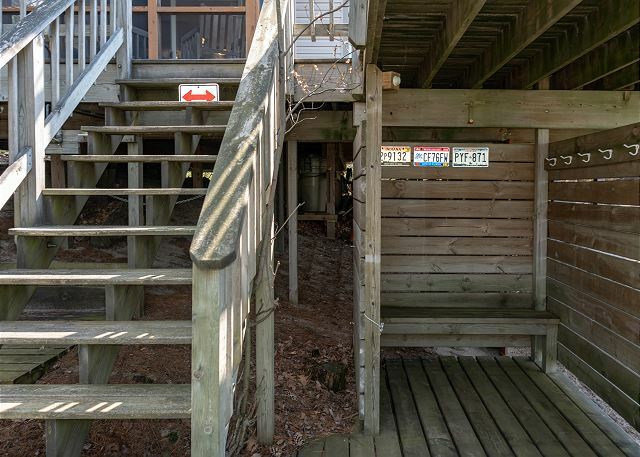 It's a bit of a climb to get back and forth to the beach from the house and I wouldn't recommend this property to anyone with really small children or anyone with issues getting up and down stairs. Some parts of the stairs going down to the beach had no railing and was a bit scary for me and it would have been really hard for me to carry a small child up and down. Overall this property was okay for just our family but if we were to vacation with another family this property wouldn't fit our needs. Our cabin was terrific. 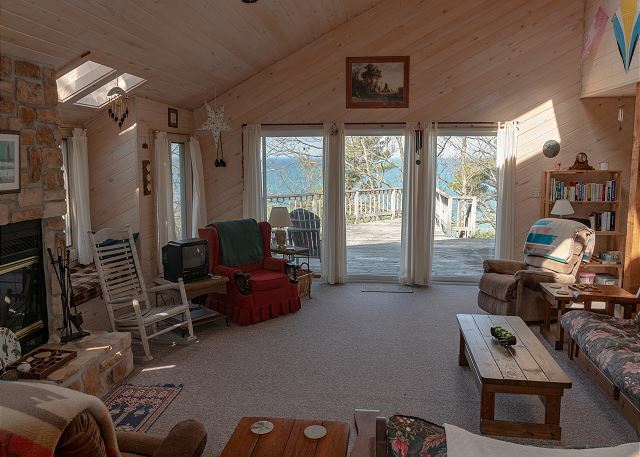 Big great room for people to hang out in, lots of light, convenient bunk beds and outdoor and screened in decks with exquisite views. Kitchen was well stocked with appliances and private beach was amazing. Only challenges were slow flushing toilets and broken dishwasher. A++. Maybe cut back on dome of the fees to dook . This home was beautiful, clean, private and right on the water. Waves can be heard from every open window. Beach is clean and beautiful. Just be prepared to walk down/up 155 steps to water. Not a difficult walk as many areas to rest along the way! Will definitely stay again! Price is very reasonable. Beautiful home. Thank you! Hi Anthony - thank you for this review. Timbershores is a special place, and that beach is impossible to beat! Thank you for staying with Unsalted Vacations, please come see us again soon.